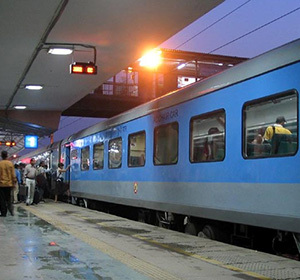 Shatabdi Express trains are a series of superfast passenger trains operated by Indian Railways to connect Metro cities with other cities important for tourism, pilgrimage or business. Shatabdi Express are day-trains and they return to the station of origin the same day. The first pair of Shatabdi that runs in the New Delhi to Chandigarh to New Delhi section which is extended up-to Kalka is train number 12005 & 12006 and it halts at Kurukshetra, Ambala, and Chandigarh on its way to Kalka as well as on its return journey from Kalka to New Delhi via Chandigarh. The second pair of Shatabdi that runs in the New Delhi to Chandigarh to New Delhi which is also extended up-to Kalka is train number 12011 & 12012 and this train halts at Panipat, Kurukshetra, Ambala and Chandigarh on its way to Kalka as well as on its return journey from Kalka to New Delhi. This train has an additional halt at Panipat compared to the first pair of trains. On popular demand and heavy rush a third pair of Shatabdi express trains has been introduced in Delhi Chandigarh section. This train is up-to Chandigarh only and runs on week days from Monday to Saturday. There is no service on Sunday. The train numbers are 12045 and 12046 and have no stoppages in between. All the trains have two classes of journey namely First AC Tier and air conditioned Chair Car Tier. Comprehensive details such as train names, their numbers, days of run and other related information of both the sets of trains are provided underneath in the table. The first two pair of trains run up-to Kalka from New Delhi and commences their return journey from Kalka and reaches New Delhi. Chandigarh to Kalka railway distance is 38 kilometers. It may please be noted that if you are calling these numbers from outside of Chandigarh then prefix it with the STD Code of Chandigarh which is 0172. For example if you are calling 131 then please dial it as 0172131. Chandigarh is a union territory of India, that serves as the capital of two states, Punjab and Haryana. The name Chandigarh translates as “The Fort of Chandi”. The name was coined from an ancient temple called Chandi Mandir, devoted to the Hindu Goddess Chandi, present in the city’s vicinity. Chandigarh Capital Region includes Mohali, Panchkula and Zirakpur. Known internationally for its architecture and urban planning, it is also the first planned city of India. Chandigarh is home to numerous architectural projects of Le Corbusier, Pierre Jeanneret, Matthew Nowicki, and Albert Mayer. As per a study conducted by Ministry of Urban Development, Chandigarh has emerged as the cleanest city in India.